Because she knew that something happened to you when your mother didn't hold you close, or tell you all the time that you were the best thing ever, or even notice when you were home: a little part of you sealed over. You didn't need her. You didn't need anyone. And without even knowing you were doing it, you waited. You waited for anyone who got close to you to see something they didn't like in you, something they hadn't initially seen, and to grow cold and disappear, too, like so much sea mist. Because there had to be something wrong, didn't there, if even your own mother didn't really love you? The only thing Jess really cared about were those two children and letting them know they were okay. Because even if the whole world was throwing rocks at you, if you had your mother at your back, you'd be okay. Some deep-rooted part of you would know you were loved. That you deserved to be loved. When Jess had Tanzie, young and daft as she had been, she'd had enough wisdom to know she was going to tell her how much she loved her every day. She would hug her and wipe her tears and flop with her on the sofa with their legs entwined like spaghetti. She would cocoon her in love. The Jewel sounded very promising. I thought for a moment this could be a really cool new dystopian, and honestly, it had the potential to be one for sure, but sadly between the underdeveloped world, dull characters and the rather uninspired writing style, this book just didn't do it for me. The general idea behind this book was really quite intriguing. Girls from the Marsh are auctioned off to Royalty from the Jewel as surrogates. They're assigned a number and the last ten girls auctioned are the most desirable ones. Our MC, Violet Lasting, is number 197. She eventually gets sold for six million diamantes to the Duchess of the Lake. Also, I found it interesting that being a surrogate is something you "are diagnosed with", it's determined by genetics. The Jewel's world reminded me a bit of the Hunger Games. The circles in this book were just like Hunger Games' districts, with each circle responsible for a different thing. The outer circle, called Marsh, is the poorest. This is the circle that doesn't have its own industry, it's just where the laborers live. It's also where our MC is from. There are four more circles: the Farm, the Smoke, the Bank and the Jewel. And obviously, the Jewel is the equivalent of the Capitol, with the royalty and all the wealth. The writing was very simplistic and - I really hate to say that - boring. It was more tell than show, with lots of repetitive descriptions and uninspired dialogues. There was nothing captivating about the style, nothing to really grab your attention, and it got real tiring, real quick. The world building was very scarce and basic, making the entire set up rather unbelievable and unconvincing. There wasn't enough background info about the society and how the world came to be the way it was described in the book, no history, no explanation for the Royals' inability to conceive their own children, nothing about the weird magical powers the girls from the Marsh possessed. Some elements seem to have been randomly included in the story. 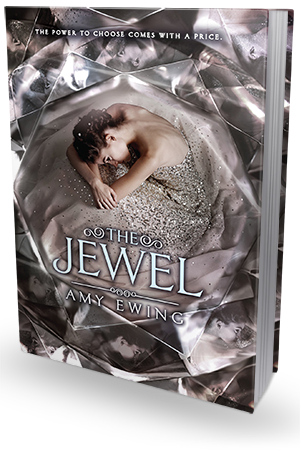 Perhaps we will get an explanation in the following books, but after the Jewel, I'm just not sure if I'm patient or interested enough to stick with the series. You can probably enjoy this book as long as you're not expecting too much from it. There are no meaningful life lessons here, no complex and biting satire of the modern society. You really won't find anything deeper here. On the other hand, it's very dramatic and fast-paced, and there are some plot developments that are sure to surprise you, so I think it can still be an entertaining little read. After all, what didn't work for me might work for you, who knows. What bothered me the most is that Violet seemed completely uninterested in her own fate. She did everything people told her to do, but not because she was scared for her life - and she probably should have been. She was a baby-bearing teenage slave, for Gods sake! But she wasn't terrified, or depressed, or determined to get out - in fact, until the moment she learned about another surrogate's murder, getting out has never even crossed her mind. Why not!? Oh God, why in the world not?! Instead she admired the interior design, the fancy bedding, the clothes.. And she giggled. No sleepless nights spent on missing her family and plotting her escape. But hey, the Duchess son was "beautiful" so that explains everything, right? It's not that I'm disappointed with this story, for there wasn't anything to make me care enough about the plot or the characters to even care. I'm more indifferent and wondering what was the point of it all. This book was like a weird combination of the Selection and Eve, and I really didn't care for it at all. Moreover, I really think this book sends a wrong message to teenage girls. I for one don't want my daughter growing up reading books such as this one, books that will make her feel like it's OK for old creeps to impregnate young girls just because they have money and power. I want my daughter to think for herself, fight for herself and never give up, no matter what. And no giggling, please.